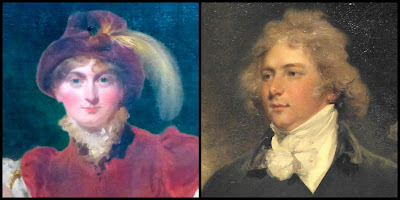 George, Prince of Wales, and Princess Caroline of Brunswick were married on 8 April 1795. Although they were first cousins, the couple had not met before the marriage was arranged. Neither the Prince of Wales nor the Princess Caroline wanted the match, but they both agreed to it. British law had severely restricted George’s choice of bride. (1) His secret marriage to his mistress, Mrs Fitzherbert, was not legal, and, desperate for money, the Prince had agreed to marry his father’s choice of bride. He was obliged to caution her “to think always before she speaks” (3) and to make improvements in her personal hygiene. 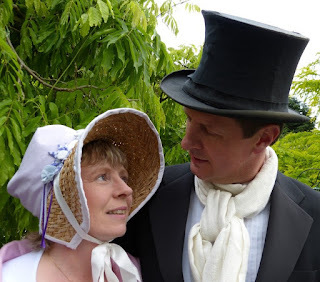 He was particularly revolted when she had a tooth drawn and had it sent to him as a gift! Caroline was unimpressed. When Lord Malmesbury rejoined her she exclaimed in French, asking if the Prince was always like that and declaring that she found him very fat and nothing like as handsome as his portrait. 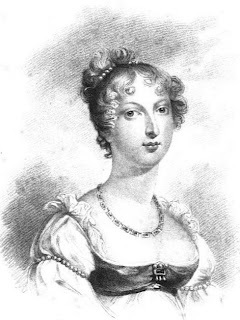 When Princess Caroline arrived in England she hoped for “great kindness and attention”. She received neither. The King was effusive in welcoming her but the Queen was cold and her future husband indifferent. George had never wanted the marriage apart from as a way to secure funds, and he was heavily influenced by his new mistress, Frances, Countess of Jersey, whom he heartlessly appointed as a Lady of the Bedchamber for his new wife. From the first moment of setting foot on English soil, Princess Caroline was subject to Lady Jersey’s spite. The Prince made no secret of the fact that Caroline was his wife in name only. When she unwisely revealed her previous attachment, Lady Jersey had no scruples in laying this before the Prince and poisoning his mind against his new wife. The Prince of Wales’ dislike grew. He wanted to divorce his wife, but the King was emphatically against it. A separation, however, was unavoidable. Caroline’s reply was also printed, saying that his letter “merely confirmed what you tacitly insinuated for this twelvemonth.” (5) She confirms that this long-standing estrangement between them had been instigated by the Prince and the Prince alone. The Prince was inconstant in his affections. In time, Lady Jersey was abandoned for a succession of other mistresses, including a return to his long term lover, Mrs Fitzherbert. But at no time did the Prince show any kindness towards his wife. He did not desire her company, and yet, when he could, he restricted her movements and limited her access to her daughter. She could not expect his love, but she deserved his respect and received none. In 1806, Caroline’s behaviour was examined by parliament after accusations that she had given birth to an illegitimate child; the “Delicate Investigation” exonerated Caroline, who won great public support through the affair. When George became king in 1820, he publicly accused his wife of adultery and Queen Caroline was put on trial in an attempt to prevent her from being crowned as queen. Public support once again rallied to the Queen and the Bill of Pains and Penalties, which would have dissolved the marriage, had to be abandoned. George did, however, succeed in barring Caroline from his coronation. Popular media of the time represented George as a libertine and Caroline as the wronged wife. From start to finish, the Prince’s behaviour was unpardonable. He had agreed to marry Princess Caroline, but failed to show her the respect due to her as wife. He paraded his mistresses in front of her and yet accused her of improper behaviour at every opportunity. Caroline, on the other hand, was an unfortunate choice of bride; her character and person disgusted her husband and her lack of restraint brought his dislike into the open. Their domestic dispute was paraded in front of the British public for over twenty years, causing the royal family acute embarrassment and loss of popularity. But perhaps the most sobering reflection is that this match was carried forward against the natural inclinations of both parties and as such, was a recipe for marital disharmony before ever the marriage vows had been exchanged. (1) The Act of Settlement of 1701 prevented George from marrying a Catholic, and the Royal Marriage Act of 1772 required the King’s consent to his marriage until he was over 25 years of age. As George III was vehemently opposed to his children marrying beneath them, this effectively left only German royalty as potential spouses. (2) From a letter dated 28 November 1794 quoted in Opinions on Politics, Theology, &c by Henry Brougham (1839). (3) From Diaries and Correspondence of James Harris, First Earl of Malmesbury, Volume III (1834). (4) From John Fairburn's account of the trial of Queen Caroline (1820)(see sources for full title). 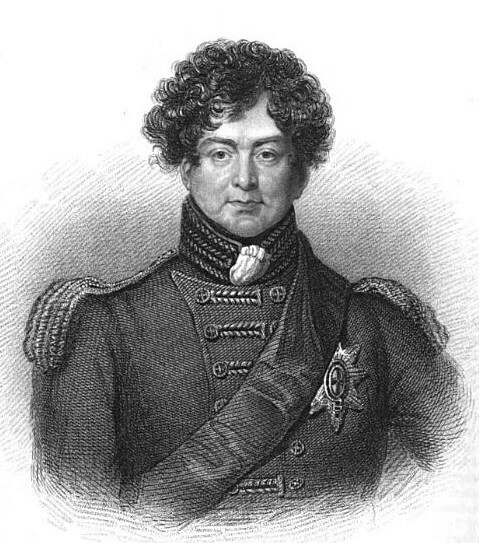 (5) From Huish's Memoirs of George IV (1830). 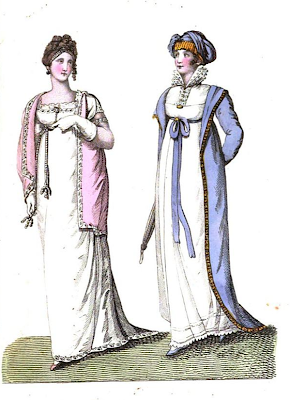 La Belle Assemblée, or Bell’s Court and Fashionable Magazine addressed particularly to the ladies, was a monthly ladies’ periodical which first appeared in February 1806. It continued under this name until 1832 when it became The Court Magazine and Belle Assemblée and later it merged with the Lady’s Magazine and Museum. It was quite expensive compared to other periodicals at the time. At the beginning of 1807, the magazine cost 2 shillings and 6d, that is, half a crown. An alternative version was then introduced which containing coloured plates for the higher price of 3s 6d. The price advertised at the end of 1811 was 3 shillings for the 1812 series. 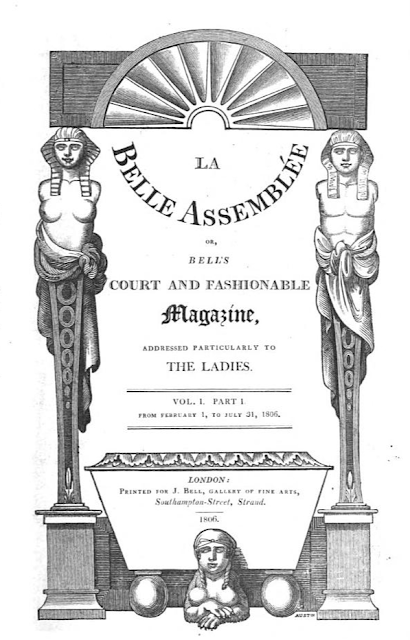 When it was first published, La Belle Assemblée was available in two parts – a magazine section and a fashion section, though this distinction was later dropped. It offered a lot more reading material than other contemporary magazines, like the Lady’s Monthly Museum, and a number of embellishments which usually included an engraving, an original piece of music, a needlework pattern and two fashion plates. The magazine section opened with a biographical sketch of an eminent lady accompanied by an expert engraving. During the first volume, the ladies profiled were: Queen Charlotte; the Princess of Wales; Princess Sophia of Gloucester; the Duchess of Devonshire (no engraving); Charlotte, the Princess Royal; Princess Sophia Augusta and Princess Elizabeth. 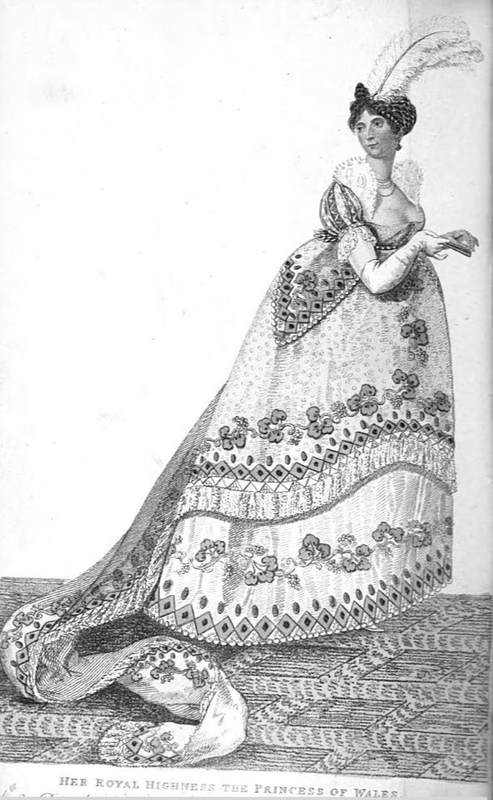 Later issues included profiles of the actress, Mrs Siddons, the Prince Regent’s mistress, Mrs Fitzherbert, and the famous singer, Madame Catalani. La Belle Assemblée prided itself on the originality of its contents and within the sections that followed, published a variety of original communications and letters, under section titles that varied over the years. These included miscellaneous anecdotes and pieces of prose such as “A history of the new world” which appeared in the first issue and advice on health, beauty and behaviour, such as “Maxims and rules for the conduct of women”. Lectures on useful sciences were also included covering such subjects as the culinary system, botany, heraldry and gardening. It also included short stories and serialised novels, such as Hymenea in Search of a Husband and Oakwood House, later published as Oakwood Hall, by Catherine Hutton. Poetry and music were another important element, with issues including both original and select poetry and an original piece of sheet music. The first volume included a retrospect of politics which had a section looking at the public amusements currently available in London, including a critical evaluation of what was on at the theatre. This section expanded in later volumes to form a 'cabinet of taste' which gave reviews of paintings, books, music and the theatre. Births, marriages and deaths were also published. The second division of the magazine was devoted to fashion and included the two fashion plates with detailed descriptions. These were originally printed in black and white, for ladies to colour themselves, but from 1807, they were available ready-coloured. 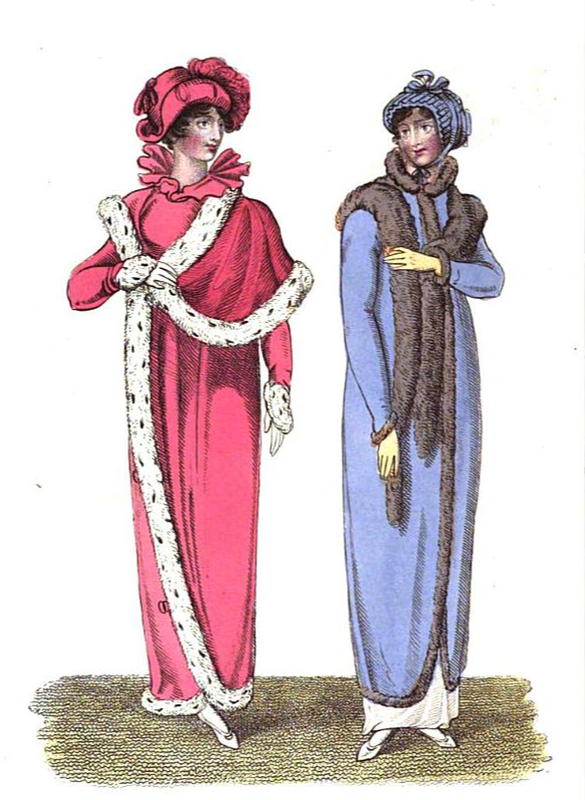 As well as general information about fashions for the coming month, this section included detailed descriptions of the dress worn by the social elite at important events, such as the king’s birthday celebrations. It also included a needlework pattern. The periodical finished with a section of advertisements, which included a list of the latest novels. Every volume offered a supplemental number with embellishments which was devoted to art and literature. The supplement to the first volume included a review of the literature of the previous six months but later supplements were sometimes focused on a single subject, such as the works of Alexander Pope. 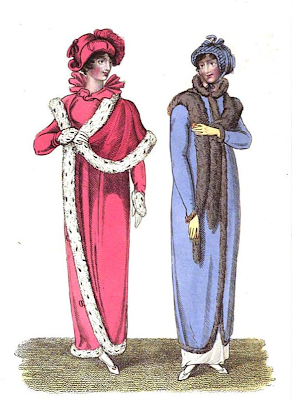 A list of editions available online with links to fashion plates where available on this page. 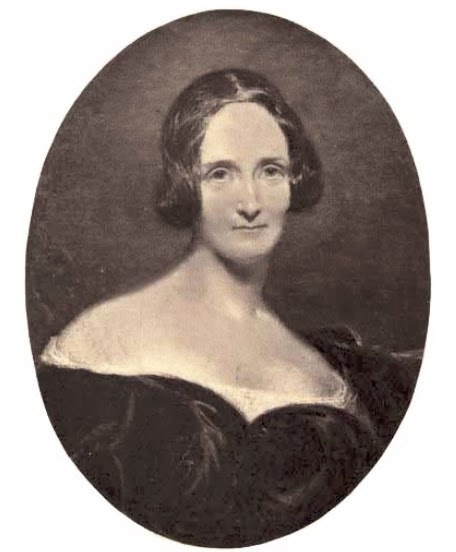 Mary Shelley (30 August 1797 - 1 February 1851) was an English writer who is most famous for her novel Frankenstein. 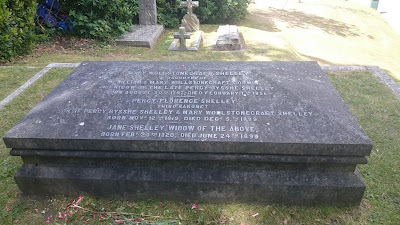 She was the wife of the Romantic poet, Percy Bysshe Shelley. Mary Wollstonecraft Godwin was born in London on 30 August 1797, the daughter of William Godwin and Mary Wollstonecraft. Godwin was a radical political philosopher and author; his most famous work, Political Justice, was published in 1793. 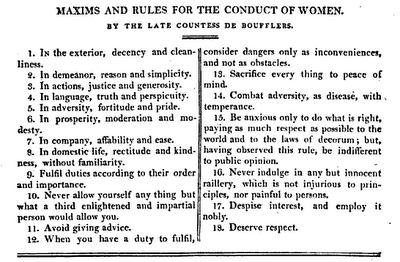 Wollstonecraft was an ardent feminist and author of A Vindication of the Rights of Woman, published in 1792. In this work, she spoke out vehemently against the position of women in society, most notably describing marriage as “legal prostitution”. Given their radical views, it is perhaps surprising that Godwin and Wollstonecraft married. However, Godwin’s intent was to provide security for their unborn child, which Wollstonecraft had lacked when her older daughter, Fanny Imlay, had been born and her lover, Gilbert, had deserted them. After Wollstonecraft’s death, Godwin published Memoirs of the Author of A Vindication of the Rights of Woman; the scandalous book was not received well as the memoirs included details of Wollstonecraft’s affairs and her illegitimate child. Mary’s mother died from complications shortly after her birth leaving her and her half-sister, Fanny, to be raised by Godwin. In 1801, he married Mrs. Claremont, who brought her own children, Charles and Jane - later known as Claire - into the Godwin family unit. Mary resented her step-mother whilst idealising her own mother. Her early years were spent in Scotland, near Dundee, and in London, where her family had a house in Skinner Street, Holborn. The Godwins were often plagued with a shortage of funds. The house in Skinner Street was a stimulating intellectual environment. Godwin received many visitors including Lamb, Burr and Coleridge, who read his poem, The Ancient Mariner, in Mary’s hearing. The poet, Percy Bysshe Shelley, and his wife, Harriet, were regular visitors to Skinner Street. Shelley was a much younger man than most of Godwin’s other friends and he revered his work, Political Justice, giving it a fanatical interpretation. Mary and Shelley fell in love and embarked upon a scandalous affair. Despite his views on marriage, Godwin did not support the relationship; he had fallen out with Shelley who had promised him money which he was not then able to give him due to his own financial situation. Together with Mary’s step-sister, Claire Claremont, Shelley and Mary went abroad in July 1814, travelling throughout Europe. When they returned to England, Mary was pregnant with Shelley’s child, and Godwin refused to receive them. The couple were penniless and found themselves ostracised from society. 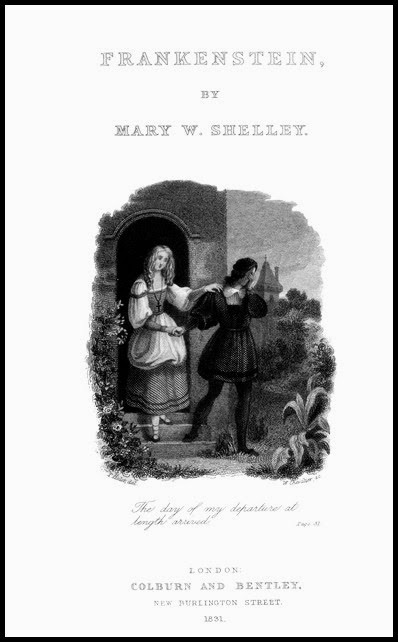 When her baby daughter died shortly after her birth in February 1815, Mary became depressed and isolated from Shelley who was trying to avoid his creditors. However, Mary fell pregnant again and gave birth to a son, William, on 24 January 1816, which eased her depression. The couple’s monetary problems were pressing, and so in the summer, they decided to go abroad to Geneva in Switzerland in the company of Lord Byron, John Polidori and Claire Claremont. It was while this illustrious company were writing ghost stories together that Mary conceived the idea for her novel, Frankenstein. On 30 December 1816, Shelley and Mary were married, following the death of Shelley’s first wife. Godwin now became reconciled to the match, but the relationship between them continued to be strained as he regularly demanded financial support from his son-in-law. In 1818, plagued by debt, the couple and their young family – William and baby Clara, who had been born on 2 September 1817 – went abroad again. Over the next three years, the Shelleys travelled around Italy, to Venice, Naples, Rome and Florence, but it was a time of great sadness. First Clara and then William became ill and died. Mary was devastated. “Everything on earth has lost its interest to me,” she wrote to her friend, Miss Curran. On 12 November 1819, Percy Florence was born, but Mary feared she would lose him just like her other children. The Shelleys were constantly short of money but gained enjoyment from reading and writing and the intellectual stimulus of their own company and that of their many visitors. On 8 July 1822, tragedy struck: Shelley was drowned when his sailing boat sunk during a storm. Mary returned to England the following year and devoted herself to bringing up her son and continuing her writing. 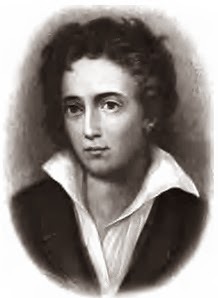 Sir Timothy Shelley provided her with a small income on the understanding that she would not publish any of Shelley’s work or a biography during his lifetime. Mary never remarried; no one else was Shelley’s equal. "Mary Shelley shall be written on my tomb,” she wrote to her friend and suitor, Trelawney. 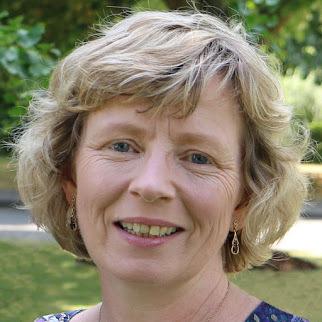 Her son, Percy, studied at Harrow and Cambridge, but showed no signs of his parents’ genius. Mary struggled with continued social ostracism and friends who continually let her down. Jane St. John, who became Percy’s wife, was a great source of comfort to Mary in the last years of her life. 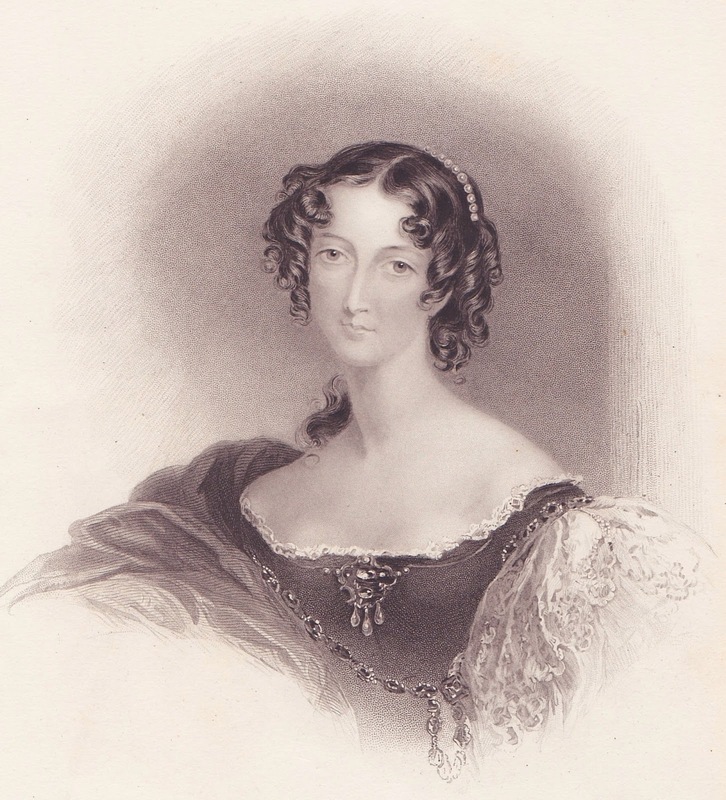 Mary grew increasingly unwell during the last years of her life and died on 1 February 1851 after a series of strokes. She was buried in St. Peter’s churchyard, Bournemouth, in Dorset. As well as Frankenstein, Mary wrote several other lesser known novels: Valperga (1823), The Last Man (1826), Perkin Warbeck (1830), Lodore (1835) and Falkner (1837). She also wrote a volume of travel studies – Rambles in Germany and Italy (1844). She also edited and promoted the work of her husband, Percy Shelley. Princess Caroline of Brunswick (17 May 1768 - 7 August 1821) was the hated wife of George IV. Her reckless behaviour was investigated twice by parliament and although the King failed to divorce her, she was deprived of being crowned as Queen. 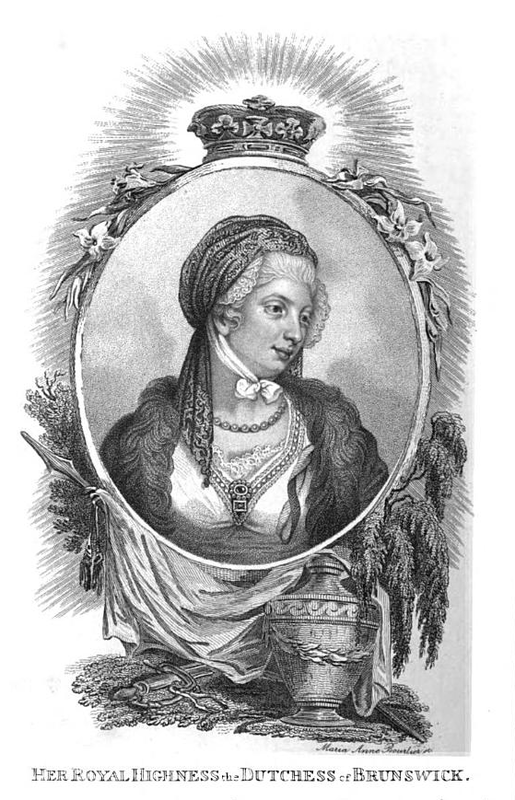 Caroline Amelia Elizabeth was born on 17 May 1768, the second daughter of Karl Wilhelm, the Duke of Brunswick-Wolfenbuttel, and Princess Augusta, the eldest sister of George III. She was brought up in the German principality with a great deal of freedom, resulting in unrestrained speech which tended to be vulgar and lacking in respect, particularly towards her mother. Unfortunately, her personal cleanliness also left much to be desired. On 8 April 1795, Princess Caroline and George, Prince of Wales, were married. From the outset, the prospects of a happy union were slim; in the event, it was an unmitigated disaster. The prince’s motivation for getting married was to appease parliament and persuade them to pay his enormous debts. 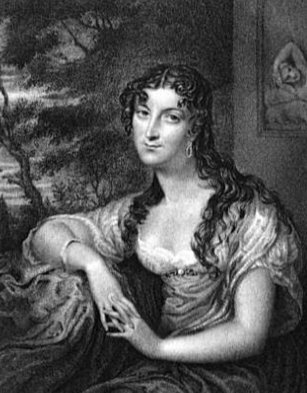 Although he had separated from Maria Fitzherbert, his long-term mistress, George was at this time infatuated with Frances, Countess of Jersey, who had encouraged him to marry to shield their relationship. George disliked Princess Caroline on sight. He heartlessly made his mistress a Lady of the Bedchamber for his new wife and did not scruple to advertise that she was her rival. Lady Jersey’s behaviour towards Caroline was unkind and cruel; the prince treated Caroline with disdain and rudeness. The royal couple only remained together as man and wife for a few weeks, but Caroline fell pregnant; she gave birth to a daughter, Princess Charlotte Caroline Augusta, on 7 January 1796. By March 1796, George wanted an official separation from his wife, but his father would not allow it. The prince refused to see his wife except on formal occasions, but nevertheless restricted Caroline’s freedom and access to her daughter. In 1805, the king, George III, made her Ranger of Greenwich Park allowing her greater independence and financial security. In 1806, Lady Douglas, a former companion of the Princess of Wales, accused her of having given birth to an illegitimate child in 1802. The government made a thorough investigation into the claims which were proved to be unfounded. It appears that the child Caroline was accused of conceiving out of wedlock was William Austin whom she had legally adopted. 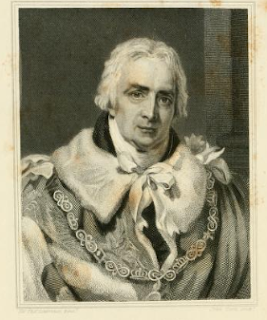 Spencer Perceval threatened to publish the findings of the investigation if Caroline was not fully restored to her royal position; “The Book” was printed despite Caroline being hastily received at Court and provided fuel for her supporters for many years. 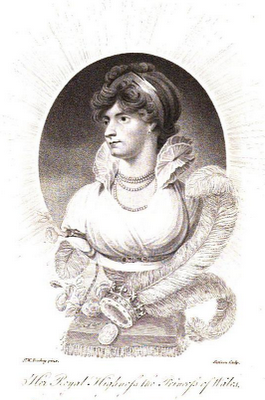 In 1814, Caroline was given leave to travel abroad, firstly to Germany and then on to Italy. Her behaviour at this time can only be described as reckless; she publicly engaged in adulterous affairs without the least discretion, the most notable of which was with Barolomeo Bergami, also known as Count Pergami. When George acceded to the throne in 1820, Caroline technically became the Queen Consort of England and on 5 June, she arrived from Italy, amidst public rejoicing, to claim her rights as queen. George wanted to divorce his adulterous wife and deprive her of her rank. In response, the cabinet introduced what is commonly known as the Bill of Pains and Penalties, which would have dissolved the king’s marriage and deprived her of her title. Her adultery was easily proven and the bill was passed by a small majority in the House of Lords, but it was dropped because of its widespread unpopularity. Although championed by ardent supporters such as Sarah, Lady Jersey, Caroline’s popularity waned; she withdrew from public view, accepting a house and an allowance of £50,000 a year. She made one final attempt to be recognised as Queen; she attempted to enter the abbey for the coronation and be crowned alongside her estranged husband. She was refused admittance, despite the sympathy of the crowd, and gave up the attempt. She died just a few weeks later, on 7 August 1821, at Brandenburg House, the house of Elizabeth, Margravine of Brandenburg-Ansbach-Bayreuth. Sarah Child Villiers, Countess of Jersey (4 March 1785 – 26 January 1867), was a leading figure in Regency society and one of the patronesses of Almack's Assembly Rooms. Lady Sarah Sophia Fane was born on 4 March 1785, the eldest daughter of John Fane, the tenth Earl of Westmorland, and Sarah Anne Child. Her mother, Sarah Child, was the only daughter and heiress of Robert Child, the senior partner in Child’s bank. He was vehemently opposed to her marrying the Earl and so the couple were forced to elope to Gretna Green, where they were married in 1782. Robert Child was so incensed that his daughter had married against his wishes that he cut her out of his will, determined not to let the Earls of Westmorland benefit from his wealth. Under the terms of his new will, everything was left in trust for his daughter’s second surviving son or eldest daughter. On this basis, on her mother's death in 1793, Lady Sarah became heiress to all her grandfather's wealth, with an estimated income in the region of £60,000 a year. She was a very wealthy lady! (1) She also inherited his position as senior partner of the Child and Co. Bank, a role which she actively held from her majority in 1806 until her death. Lady Sarah married George Villiers, Viscount Villiers, on 23 May 1804. George Villiers became the 5th Earl of Jersey on his father’s death in 1805. The Earl took his wife’s name in addition to his own by royal licence in 1819 (2) and became known as George Child Villiers. The couple had seven children who survived infancy: George (1808), Augustus (1810), Frederick (1815), Francis (1819), Sarah (1822), Clementina (1824) and Adela (1828). Although Lady Jersey had inherited Osterley Park from her grandfather, the couple chose rather to live at Middleton Park in Middleton Stoney in Oxfordshire, where Lord Jersey successfully bred and trained racehorses. When in London, they resided at 38 Berkeley Square. She was one of the patronesses of Almack’s Assembly Rooms, where she famously refused entry to the Duke of Wellington who turned up at the Rooms at seven minutes after 11pm when the doors were shut. On returning from Paris in 1815, she introduced the quadrille to the Rooms. In her letters, Harriet, Countess of Granville, refers to Lady Jersey as “Silence”. The nickname does not appear to be used maliciously – it is rather a joke on her friend’s loquaciousness. Captain Gronow describes Lady Jersey as being “inconceivably rude”, but Sir William Fraser describes her as being “very quick and intelligent, with the strongest sense of humour that I have ever seen in a woman; taking the keenest delight in a good joke, and having, I should say, great physical enjoyment of life." 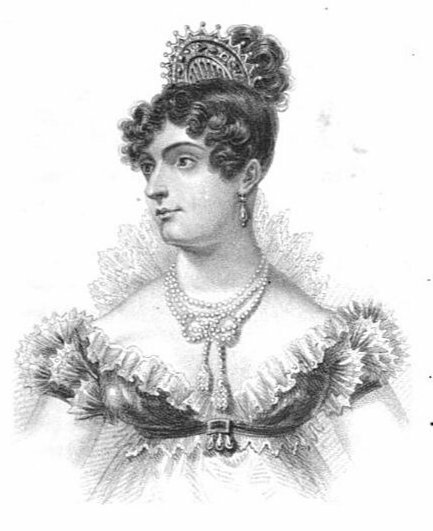 Lady Jersey was immortalised as Zenobia in Disraeli’s Endymion. 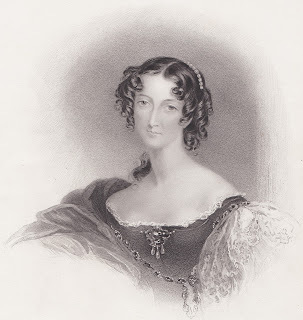 She also featured as Lady Augusta in Lady Caroline Lamb's scandalous novel Glenarvon. For many years, Lady Jersey was an ardent supporter of the Whigs. She was a passionate advocate for Princess Caroline, Princess of Wales, and was her most prominent female supporter during the “Queen Caroline Affair” of 1820-21, when the Prince of Wales sought to prevent his estranged wife from assuming her role as Queen. Lady Jersey found herself under personal attack from John Bull, the most successful and widely circulated contemporary loyalist newspaper, which led to a libel suit against John Bull for impugning her honour. By the end of the 1820s, she had switched her political allegiance to the Tory party and was championing Wellington and Peel. Her influence as a political hostess faded in the 1840s and she was eclipsed by others, particularly by her old rival Lady Cowper who had married Lord Palmerston in 1839. 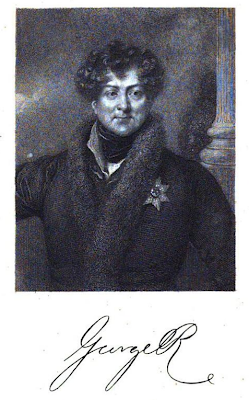 Lady Jersey is not to be confused with Frances Villiers, Countess of Jersey, her notorious mother-in-law, who was once mistress to George IV while he was Prince Regent and was instrumental in encouraging his hatred towards Princess Caroline. Lady Jersey died on 26 January 1867 at the age of 81 years. She left most of her property to her grandson, the 7th Earl of Jersey, but made generous bequests to her other grandchildren. She was buried at Middleton Stoney in Oxfordshire. (1) The estimated income of £60,000 is from the Oxford Dictionary of National Biography (see below), but it gives no date as to which year it relates to. Taking 1804, the year of Sarah's marriage, as a base point and using the Measuring Worth website, an income of £60,000 would be equivalent to £4.12 million using the retail price index or an even greater £51.5 million using their average earnings method. Either way, it was a huge income! (2) The Oxford Dictionary of National Biography suggests an earlier date of 1812. 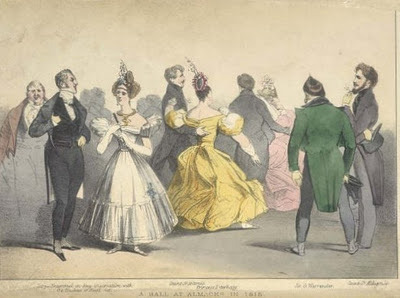 For a discussion about relative costs in the Regency period, see my blog post: How much did a ticket to a Regency ball really cost? 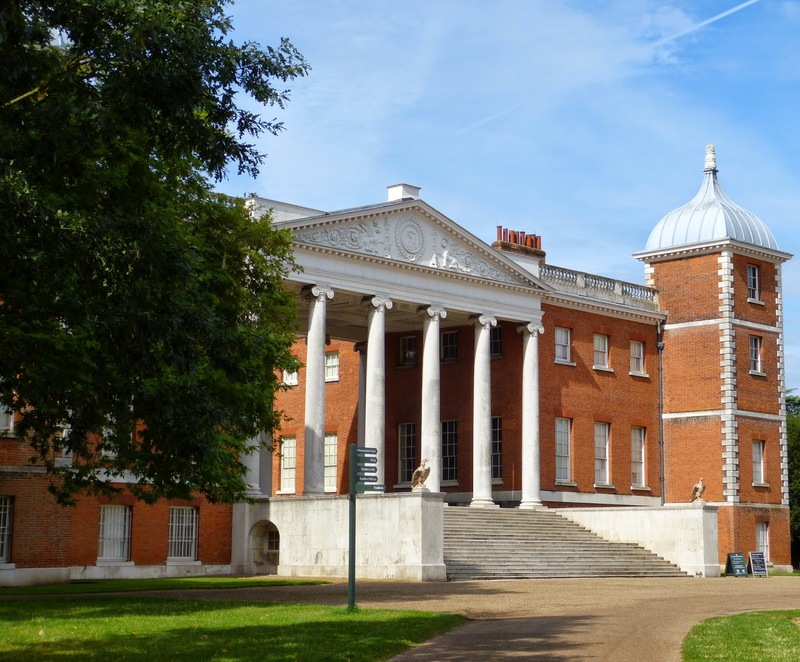 More photos of Osterley Park by Andrew Knowles on Flickr. During the Regency period, Almack’s Assembly Rooms were at the heart of the London season. Their importance cannot be overstated. Possessing a voucher to enter the sacred portals of the Rooms could make or break a young lady’s entrance into the ton and her chances of finding a suitable husband. Almack’s Assembly Rooms opened on 12 February 17651 in King Street, St. James, in the heart of fashionable London. They were situated immediately to the east of Pall Mall Place and, according to Horace Walpole, when they were opened, there were three very elegant rooms, one of which was planned to be 90 feet long. The Rooms were named after their founder, who is thought to have been a Scotsman. No one seems quite sure whether his name was Almack or whether this was a pseudonym to disguise his Scottish origins, as anything Scottish was out of favour at this time. He also founded a coffee house in 1763 which was later to become Brooks' club for gentlemen. During the first phase of the life of Almack’s, the Rooms were home to a ladies’ club, where both sexes met to gamble, whilst dancing went on in the great room. It rivalled Carlisle House, whose entertainments, run by the redoubtable Madame Cornely, were becoming increasingly scandalous. Almack’s combated the mixed nature of the Carlisle assemblies by developing an exclusiveness that set it apart. 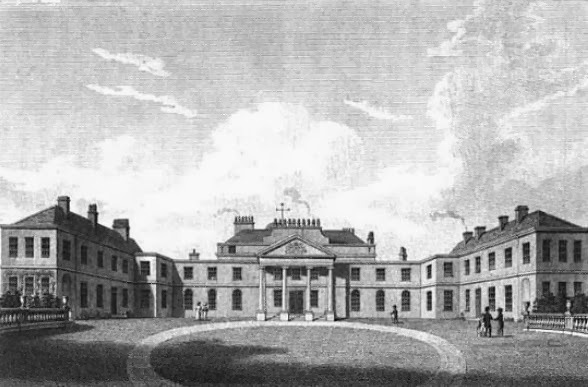 Almack’s suffered a loss of popularity when the Pantheon opened in 1772; however, the latter was burnt down twenty years later and although rebuilt, it never rivalled Almack’s again. From the 1790s onwards, Almack’s entered a new phase. The ladies’ club dwindled and the excessive gambling disappeared and the Rooms became entirely given over to dances and assemblies. Almack’s became the place for a young lady to be seen to demonstrate her position in the ton and for a gentleman to go in search of a wife of good social standing. Hence, it became known as “The Marriage Mart”. Almack’s exclusivity stemmed from the way that it restricted its membership. To attend the weekly balls, held on Wednesday evenings in the season, it was necessary to procure an annual voucher. According to Jesse, the subscription was ten guineas “for which you have a ball and supper once a week for twelve weeks”. However, in order to obtain a voucher, one needed to be approved by the committee of six or seven high ranking ladies who governed Almack’s. Subscribers were allowed to bring a guest on a “Stranger’s Ticket”, but this guest still had to be approved by the patronesses before admittance. To be offered a voucher meant acceptance into the ton; to lose one’s voucher indicated social ostracism. The committee changed over time, but in the middle of the Regency period, Gronow records that they were: Lady Castlereagh, Lady Jersey, Lady Cowper, Mrs. Drummond Burrel, the Countess Esterhazy and the Countess Lieven. According to Ticknor’s diaries, only one lady acted as patroness at a time on a rotation basis, but the members of the committee are usually referred to collectively as the patronesses of Almack’s. The patronesses met every Monday night during the season to decide who to drop from their membership and who to extend a voucher to. Vouchers were granted to those who met the criteria of the patronesses. This depended more on position in society, address and behaviour than on wealth. If granted a voucher, a young lady would be introduced to suitable partners by the patronesses. During the height of the Regency, supper was served at 11pm, after which time no further admittance to the rooms was allowed. According to Gronow, the Duke of Wellington was famously turned away by Lady Jersey for arriving after the cut-off time of 11pm when the doors were closed. The refreshments on offer were meagre; supper consisted of bread and butter and fairly plain cake, with tea and lemonade to drink. 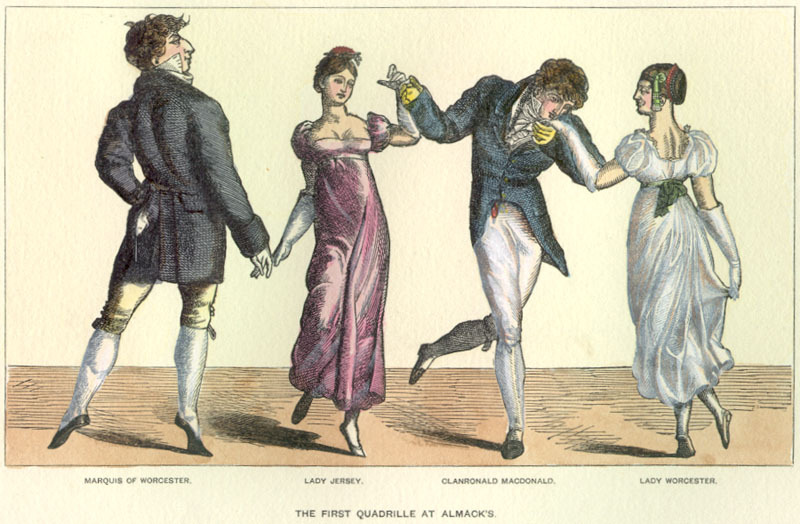 The correct garb for gentlemen at Almack’s at this time was knee breeches, white cravat and chapeau bras. Only country dances – both Scotch reels and English country dances - were performed until about 1815 when Lady Jersey introduced the quadrille and the Countess Lieven introduced the waltz. (1) Gronow states the opening of Almack’s as 12th February; other sources say 13th or 20th. However, they all seem agreed that it opened in February 1765.